Lwintgya which means the people bloom up and fall down some where and they are the unsettled people. Both languages convey the same meaning. Linguistically, ra, ya,la and ,wa are interchangeable' therefore ra in Rohingya and la in Lwintgya carry the same changeable value. 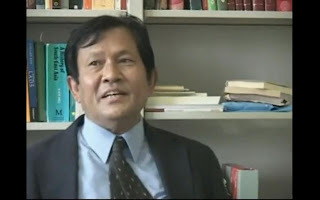 In the 1950s, the movement for a State was led by "Mujahids" among the Muslims living on the boarders of Arakan and Bangladash.This political tradition is being carried out by the Rohingers who, according to this author's information, will establish a State called Rohinstan in 2008.The area of this State will comprise some land of both countries-Bangladesh and Myanmar. In the 1990s, the movement of Rohinger in the shadow of human rights became popular. The so called Burma specialists supported the movements without knowing its political objectives. Before 9/11 some of its leaders were disciples of the terrorists. In short Rohingas are Muslims. Their objective is primarily to gain a State. What ever other reasons they give are not important.